A unique blend of a myriad of savory and sweet flavors, including vinegar, molasses, anchovies, sugar, onions, and garlic, classic Worcestershire Sauce is a British staple used everywhere in the world! Delicious in stews, chili con carne, homemade barbecue sauce, Caesar salads, and hamburgers, this one-of-a-kind sauce is nothing less than essential for making the perfect Bloody Mary. 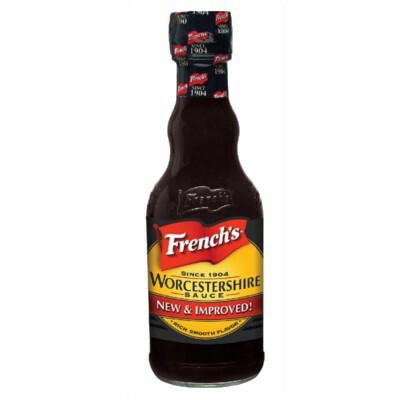 Beloved by Americans, our Worcestershire sauce comes from French's, our favorite condiment brand! Distilled vinegar, water, molasses, corn syrup, salt, sugar, spices, color E150, anchovies (fish), natural flavors (soy), thickening agent E415, dehydrated garlic powder, tamarind extract. Contains GMO. Nutrition facts (for 100ml): calories 0Kcal, total fat 0g (saturated fat 0g), total carbohydrate 20g (sugar 20g), protein 0g, salt 3.3g.